Food's ready! I scream upwards, hoping my voice travels through the staircase and into the boys' bedroom doors, which, of course, is shut tighter than a bank vault. While reverberating music throbs through one of the rooms, the other one is eerily silent, except for the spasmodic click-click of a gaming mouse. Did they hear me? I call their cell phones. Only a ring tone can catch their attentions. We're having Chinese Tacos tonight, which isn't really the dish's name. It is probably more elegantly called Phoenix Nest or Dragon's Parcels, but when I first made this years ago from a handed-down recipe, the boys loved the fact that they had another excuse to eat with their hands, aside from the usual burgers, fries, nuggets and Mexican tacos! The dish has an extra crunch to it today with the addition of fresh water chestnuts. Although the canned variety provides enough texture to a dish, I was really pleased with the firm, crisp bite and sweet flavor the fresh water chestnuts gave. Adding it at the last minute preserves their texture. If these are not available where you are, how about experimenting with Jicama? 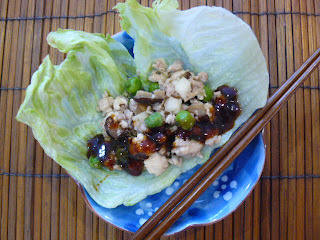 Serve with fried rice or noodles. Heat 3 tablespoons of oil. Saute ginger and onions. 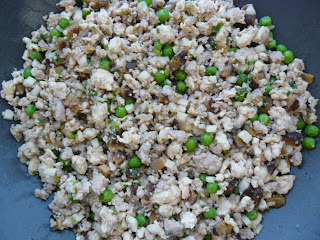 Add minced pork and chicken. 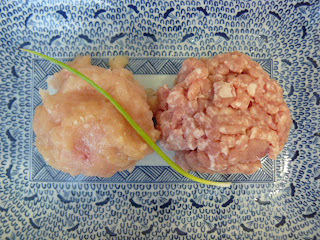 Mix well and cook until meats are opaque. Add soy sauce, oyster sauce, sugar. Mix well. 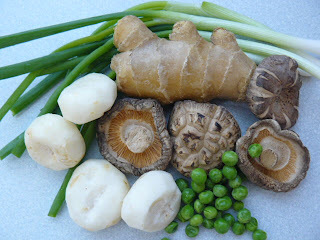 Add mushrooms, peas and water chestnuts and stir for 2 minutes, or until meats are cooked. Transfer to serving platter. In the meantime, make the sauce. Mix hoisin sauce, sesame oil and sugar in a pot and simmer over low heat, continuously stirring for about 1 minute. To serve, eat as you would do with a taco, laying a lettuce leaf on your plate and placing some meat mixture in the middle of the lettuce. 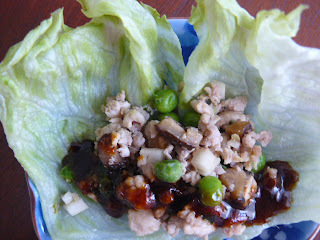 Drizzle sauce over the meat and pick up filled lettuce with your fingers, folding over the leaves to prevent the meat and sauce from dripping . Here where I'm from we call them "lettuce wrap". They are quite filling if you don't want a heavy meal. Maybe when my mother is in a "good" mood, I'll tell her if we can eat in a chinese restaurant. But I doubt she'll say yes because we just ate out in a korean place with one of your children which was very nice the food was good. -your relative who is related to you and is the daughter of Susan B.